CLIL life in Rainbow English: What can you do with an interesting book? What can you do with an interesting book? Children's library can be inspiring. The idea was to teach a bit of science. I thought about life cycles. Then while looking for activities I realised that in my kids' bedroom I have an excellent book - a gift from their aunt living in the UK. 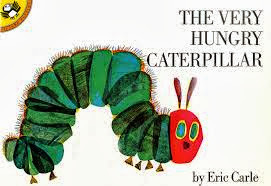 "The very Hungry Caterpillar" is over 40 years old but still attracts children's attention. This book was a base for two different scenarios. As you know, the hungry caterpillar gobbles more and more every day. The whole story may be treated as a great way of revising/introducing (!) names of weekdays and/or plural forms not to mention food. The story is quite short and simple so accompanied by some worksheets makes the whole lesson. Exactly 45 minutes - perfect timing. The story tell us a lot about life cycle as well. It starts with a tiny egg laid under the leaf, reveals details of all the stages - egg, larva, chrysallis to end up with a beautiful picture of an adult butterfly. I used it as an introduction to a more "serious" teaching about a life cycle of butterflies. Both lessons started with a short discussion about the topic. It is important to involve students into the topic by allowing them to brainstorm and say what they already know about the matter. I described the schedule of the lesson and the book itself. Then, we watched a film and the book. 1. What day does the caterpillar eat through an apple? 2. What does he eat on Friday? 4. What on Saturday? (that is a difficult question even for me! But they managed as a group to answer it). The last task was to colour the food. All the works are hanging on our CLIL board. After watching the story I asked if they could elicit all four stages of the life cycle of the butterfly. I wrote their answers on the blackboard. Then, I handed out two worksheets found on Education.com. Both of them describe and visualise the stages. To check if the students were right we read the texts together and watched a film made by Chicago Nature Museum. It is great as the timelapse technique shows perfectly the metamorphosis. What is more, the whole film has got subtitles, so it was easy to understand what was happening on the screen. For me - a great use, as I could find the best words to describe the processes. Then, I distributed the last task - a pie chart about the monarch butterfly. It also comes from Education.com. Students cooperated in pairs trying to fill the chart according to the data provided in the task. All of them were provided with a list of vocabulary to be learnt for the next lesson.